From the Castle Inn continue downhill to cross the River Lyd and ascend past the upper entrance to Lydford Gorge (National Trust). Pass under the old railway line, and climb steadily past the lower entrance to the Gorge. Now in the hands of the National Trust, Lydford Gorge is worth a visit. 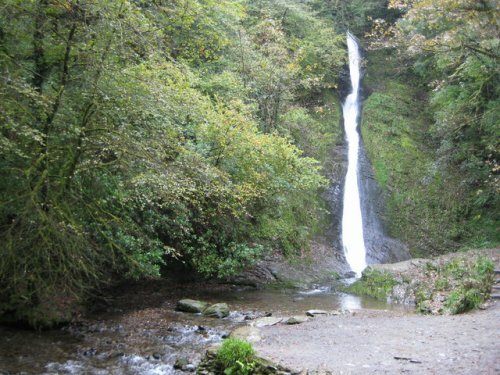 The River Lyd has carved a 2.4km - (1.5-mile) long gorge via a series of waterfalls and pools, which can be viewed from walkways through the beautiful woods. There is also a cafe on site. Follow this lovely open road for 2.75km/1.75 miles, soon with good views left towards the moor, eventually dropping past Burnville Farm. At the next junction turn left, signed to North Brentor, soon following the lane right to reach the war memorial in the centre of the village. Side-trip to the church of St Michael de Rupe. Keep ahead at the war memorial and follow the lane out of the village; at the T-junction turn left for 800m (take care: fast road) to reach the car park. Return the same way. The church of St Michael de Rupe is a real landmark in West Devon, sitting atop a 335m/1100ft core of volcanic lava more than 300 million years old. 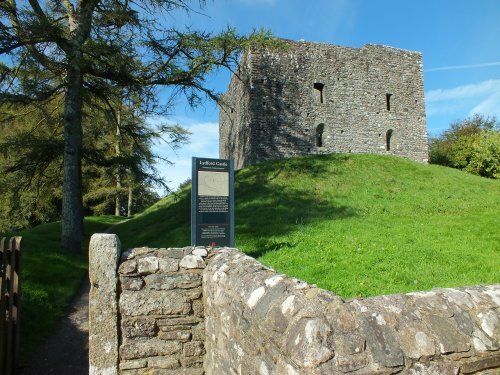 All manner of legends are attached to the building of the atmospheric and tiny church, which dates from around 1130. Turn left to pass Victorian Christ Church and village hall. 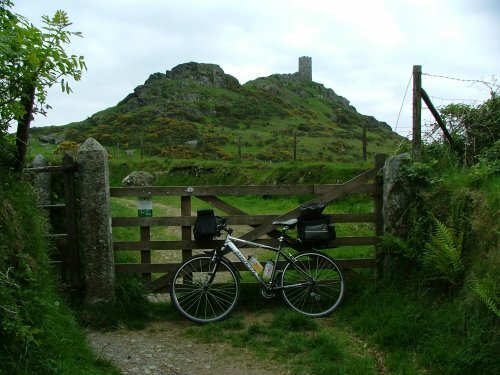 Drop downhill to cross the old railway line by the former station (built in 1890), and ascend over a cattle grid and along the lower slopes of Gibbet Hill, with wonderful views of St Michael`s church on its volcanic plug through lofty beech trees on the right. The lane bears left and crosses open down, then a cattle grid at the edge of Mary Tavy. At an S-bend bear left down Chapel Lane to reach the A386 opposite the war memorial. The Royal Standard PH is 200m to the left; for the village stores and The Mary Tavy Inn turn right (the latter is accessed via a path that parallels the A386). Cross the road with care and descend Bal Lane, which passes houses then ascends past a turn to Horndon (The Elephant`s Nest Inn) and the school. Where the lane bears sharp right over a bridge bear left along a lane to pass St Mary`s Church. The landscape around Mary Tavy bears evidence of great mining activity in the past: Wheal Friendship was the largest of Dartmoor`s copper mines in the 19th century. In the graveyard of St Mary`s Church you can find the gravestone of William Crossing (1847-1928), who spent his life exploring and writing about Dartmoor. His Guide to Dartmoor (1909) is one of the best-loved works of reference still in use today, and he was one of the earliest members of the Dartmoor Preservation Association. Continue past the church; the tarmac ends at Mary Tavy Power Station. Dismount and follow the rough track down to cross the River Tavy on a footbridge. The surfaced lane is reached again by the Peter Tavy Inn. The flourishing market town of Tavistock is steeped in history. The 10th-century Benedictine Abbey was sacked by the Vikings; little remains today of the second abbey, granted a charter in 1105. It had a flourishing woollen industry and in 1395 became a stannary town. At the Dissolution the first Earl Bedford took over, and his descendant - the Seventh Duke - created the impressive range of 19th-century buildings in the town centre. The Bedfords owned Devon Great Consuls Mine in the Tamar Valley, the most productive source of copper in the world in the 1850s. The Tavistock Canal was constructed early in the 19th century to link the town with Morwellham Quay on the River Tamar, a bustling port. The town`s brilliant Pannier Market dates back over 900 years, and you`ll find everything you need here or in the town`s excellent range of independent shops.